Putting the right keywords on your resume is critical to achieving success as a jobseeker. But do you really understand why keywords are important, and how you should go about using them? 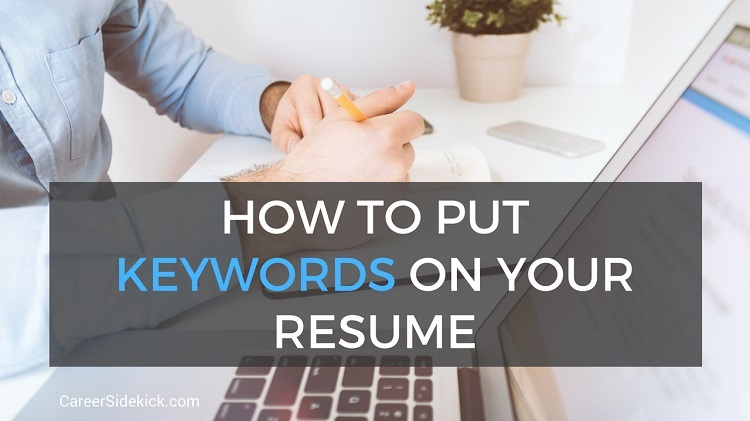 Read on for all the ins and outs of incorporating keywords into your resume so you can land the job you want! Why Use Keywords on Your Resume? With more and more companies using applicant tracking systems (ATS) in their hiring process, the first hurdle most jobseekers need to clear is getting their resumes past the robot and into the hands of a human recruiter. But how can keywords help you to do that? ATSs use software applications to scan resumes, looking for specific keywords related to the open role. Once your resume has been scanned, it is ranked according to how closely your qualifications match the job ad. Essentially, ATSs are used specifically for weeding out unqualified candidates. Being diligent about matching keywords and phrases from the job ad into your resume can help you pass the first test. By carefully reading the job post, you should be able to glean what some of the most important keywords might be. Typically, you’ll want to pay close attention to the wording of the “required” skills and the “preferred” skills that the employer calls out in the job ad, as well as any educational requirements, such as a Master’s Degree. When adding these elements to your resume, use the exact language the employer uses in the ad. You might think it best to be creative and experiment with the language in your resume, but don’t, since doing so could inadvertently eliminate you from consideration. Many ATSs are unable to read nuance, meaning that if the job ad asks for a skill such as “experience writing newsletters” and you write “experienced with newsletter writing” the ATS could deem you an unqualified candidate despite the fact that both phrases mean the same thing. If you’d like to expand upon your skills and show off your writing talents, get creative in your cover letter. To find the right keywords to use, take a look at the job posting you are applying to, plus others that are similar to the position you are seeking. Search for job listings that match your background and experience and look to see what they all have in common. Look for keywords that you see in multiple job listings and incorporate those into your resume. This will ensure that you are including the most sought-after skills and buzzwords in your resume, which will make customizing your resume for each job application easier. When customizing your resume to a specific job, pay attention to the “qualifications” and “responsibilities” the employer is seeking and then give those a place of prominence in your resume. Taking the time to do this will also make you much better prepared to answer interview questions, so this step is highly recommended. Recruiters want to know exactly what you’ve done in your professional past and what skills you’ve acquired along the way, so it’s important to be as specific as possible when wording your resume. Saying that you have experience in “advertising” or “accounting” is too broad, since there are many job titles and skills that could potentially be associated with those industries. Using keywords like “junior copywriter” or “accounts receivable” will provide a more well-rounded idea of where your talents lay. How Many Keywords Should You Use? There’s no hard and fast rule about keywords. In fact, some experts believe that there is no such thing as too many keywords in a resume. However, do be sure that your resume is well-written, and that the keywords are used in a natural way that will make sense to a human recruiter. In short, use as many as possible of the keywords that are most relevant to the position (assuming, of course, that you actually possess that skill.) According to experts, keywords should be utilized throughout your resume, which means adding them to your professional summary, to your skills sections, and to the individual descriptions of each of your past jobs. Again, make sure the keywords mimic precisely the language used in the job ad. This will give you the best shot at getting your resume past the ATS and onto the recruiter’s desk. If you’re still a little unsure as to how to incorporate keywords into your resume, know that using a professional resume builder can help. Resume builders can suggest keywords and phrases that will help you illuminate your professional experience and promote your valuable skills. Always include a cover letter with your resume, and here too, use the opportunity to include critical keywords to make an impact. While some jobseekers think that a cover letter is a waste of time, they’re not. In fact, many recruiters use these letters as a way of distinguishing between two candidates with similar qualifications. This means that if you and another candidate have very similar skillsets, educations, and professional experiences, a well-written cover letter—with well-appointed keywords—could mean the difference between getting an interview. . . or not. Remember to include keywords throughout the cover letter, but unlike in your resume (where the goal is to match as many required skills as possible), just focus on one or two of your top relevant skills in the body of the letter. Since 2005, LiveCareer’s team of career coaches, certified resume writers, and savvy technologists have been developing career tools that have helped over 10 million users build stronger resumes, write persuasive cover letters, and develop better interview skills. Land the job you want faster using our free resume samples, templates, writing guides, and easy-to-use resume-builder software.